Since most endangered species live in remote, out-of-the-way places, it's a rare for the average person to view endangered, threatened animals roaming freely on their home turf. Sea turtles are a remarkable exception. From May to September, female sea turtles of up to 1,000 pounds ponderously crawl ashore night after night on beaches throughout the Southeast but primarily in Florida. 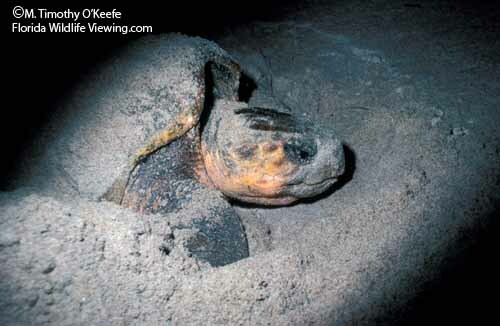 Each turtle has the same single-minded goal: to bury her eggs in a nest and return to the sea before daylight. Witnessing a nesting sea turtle is an unforgettable lesson in species survival. These sea turtle photos will give you an idea of what the experience is like, but they lack essential elements: sound, smell and the occasional feel of a pesky mosquito. Everyone should take a turtle walk sometime in their life.